Hollande is caught between a rock and a hard place. The rock is the European Commission, which has been pushing him to reduce deficits significantly. Having been given a two year extension on the rules that demand a 3% deficit or lower, Hollande has to find the money. The easiest way to do that, and the fastest, is to raise taxes. That French taxes are high is not the main problem, despite the fact that they are the highest in the Euro-area. Like the Scandinavian countries, French citizens get a lot for their money in terms of a high level of public services, including high quality day care and generous allowances for child-care, which have translated into France having one of the highest birth rates in the EU (alongside Sweden). The problem is that with the economy slowing and unemployment high (esp. youth unemployment), ordinary citizens don’t want to hear of any tax increases, in particular because they see the rich leaving for across-the-border tax havens, such as Belgium, and government officials maintaining their perks. The hard place, then, is the citizens. It is all the harder for Hollande, given his popularity ratings, which are the lowest historically for any President of the Fifth Republic, and because he has failed to find a discourse that legitimates his adherence to Eurozone agreed austerity—remember that he pledged ‘growth’ in his presidential campaign—or a strategy that actually could deliver growth. Posted on October 27, 2013 October 30, 2013 Author eamrienCategories ArticlesLeave a comment on Why Are Neoliberal Ideas So Resilient? Vivien Schmidt’s co-edited contribution to Cambridge University Press’s Contemporary European Politics series has been released in the UK and will be available in the US by the end of the month. The book – Resilient Liberalism in European Political Economy – explains why neoliberal economic ideas have not just survived, but thrived since the 1980s – taking Europe from boom to bust. Why have neo-liberal economic ideas been so resilient since the 1980s, despite major intellectual challenges, crippling financial and political crises, and failure to deliver on their promises? Why do they repeatedly return, not only to survive but to thrive? This groundbreaking book proposes five lines of analysis to explain the dynamics of both continuity and change in neo-liberal ideas: the flexibility of neo-liberalism’s core principles; the gaps between neo-liberal rhetoric and reality; the strength of neo-liberal discourse in debates; the power of interests in the strategic use of ideas; and the force of institutions in the embedding of neo-liberal ideas. 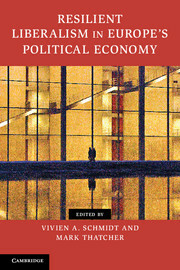 The book’s highly distinguished group of authors shows how these possible explanations apply across the most important domains – fiscal policy, the role of the state, welfare and labour markets, regulation of competition and financial markets, management of the Euro, and corporate governance – in the European Union and across European countries. Vivien A. Schmidt is Jean Monnet Professor of European Integration and Professor of International Relations and Political Science at Boston University and Founding Director of Boston University’s Center for the Study of Europe. Contemporary European Politics presents the latest scholarship on the most important subjects in European politics. The world’s leading scholars provide accessible, state-of-the-art surveys of the major issues which face Europe now and in the future. Examining Europe as a whole and taking a broad view of its politics, these volumes will appeal to scholars and to undergraduate and graduate students of politics and European studies.